President Obama today plans to deliver a speech at the National Defense University in Washington in which he is expected to discuss the legal framework under which he has conducted his administration’s counterterrorism program. The speech comes at a time when the administration’s increased use of drones to kill terrorist suspects has come under scrutiny on Capitol Hill. On Wednesday, Attorney General Eric Holder sent a letter to congressional leaders acknowledging that the U.S. used a drone strike in Yemen in 2011 to kill radical Muslim cleric Anwar al-Awlaki, an act that had raised questions because al-Awlaki was a U.S. citizen. The administration also disclosed that three other U.S. citizens had been killed in past drone strikes, two in Yemen and one in Pakistan. Obama is also expected to address the use and future of the Guantanamo Bay prison. Obama had pledged to close the prison at the beginning of his administration; detainees who are suspected of being terrorists are still held there. Despite the questions raised about the drone program by lawmakers of both parties, a majority of Americans (56%) continue to support the program, according to a February survey. Just 26% registered disapproval. 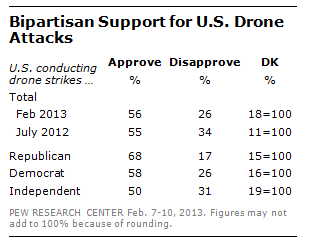 The support cuts across partisan lines – 68% of Republicans approve of the drone strikes as do 58% of Democrats. Independents support the program by a 50% to 31% margin. However, 53% of those surveyed said they were “very” concerned that the drone strikes endangered civilian lives and another 28% described themselves as somewhat concerned. There was less concern about the legal basis for ordering the strikes, one of the issues that came up after the killing of al-Awlaki. About three-in-ten (31%) of Americans described themselves as “very” concerned about whether strikes were conducted legally, while another 35% said they were somewhat concerned.